xJournal offers you a flexible way of managing various information, projects and tasks. You can structure everything as you like, search the whole database, sort and limit the displayed data. It comes with five different types of nodes for folders, calendars, projects, tasks and notes. You can build your own tree from those nodes and nest them in any order. Different options for the different nodes allow you to keep track of projects and find the information you want. 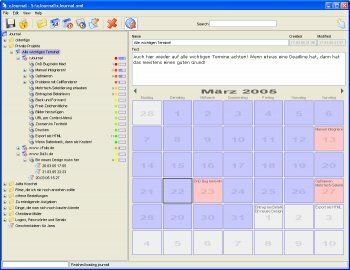 It can be used to manage your favorite dishes, a list of upcomming movies, all your passwords (with encryption) and much more.